FEBRUARY 26--A North Carolina woman is jailed on multiple felony charges after she allegedly opened fire in a movie theater during a dispute over assigned seats at a screening of “Black Panther,” according to police and court records. 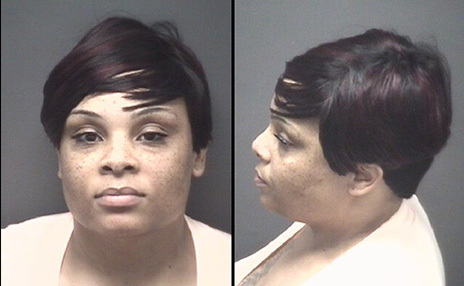 Investigators allege that Shameka Latrice Lynch, 30, squabbled with other moviegoers around 11:45 PM Friday at a crowded AMC theater in Greenville. During the dispute over seating arrangements for the Marvel superhero movie, Lynch allegedly pulled out a .32 caliber pistol and discharged the weapon inside the theater. Lynch, seen above, fired one round into the theater’s ceiling, police allege. While the shooting resulted in no injuries, Lynch has been charged with two counts of assault with a deadly weapon with intent to kill (prosecutors have identified the victims as two men attending the “Black Panther” showing). Lynch is also facing a third felony count for discharging a weapon in an enclosure to incite fear. The shooting prompted police to evacuate the entire 12-screen multiplex. Lynch surrendered to police Saturday evening and was booked into the Pitt County Detention Center, where she is being held on $250,000 bond. Lynch is next due in court on March 14.